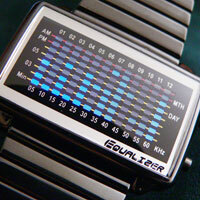 The Cutting Edge Technology out of Tokyo is releasing the High Frequency Equalizer wristwatch. The manufacturers have really high expectations for this watch. They are claiming that people are going to go bananas over this and Tokyo Flash is going to limit sales to two per person. I don't want to be the bearer of bad news, but I doubt this is going to be the new Hello Kitty, it's cool, but not Hello Kitty cool. Only a single LED is used for the Advanced LCD display. This watch is available for 17800 (around $160 USD) and a PhD certificate is required upon purchase as proof that you can figure out how to read the thing.